Lane & Associates Family Dentistry in Southern Pines is apart of a North Carolina born and bred company serving the state of NC for almost 40 years. Our Southern Pines dentists and staff are committed to dental excellence and always strive for a 5-star experience! From dental cleanings & porcelain veneers to wisdom teeth removal & orthodontics – our staff is here to make your appointment as seamless as possible. Due to our partnership with an in-house oral surgery and orthodontic group, you and your family can meet all of your dental needs under one roof! We are also proud to accept & file over 18 insurance providers and offer programs such as our Child’s First Dental Visit or Free Teeth Whitening program for patients! Give our office a call at (910)295-5980 to schedule your dental appointment with our Southern Pines NC Dentists today! At Lane & Associates Family Dentistry, we love to make you smile! WE’VE MOVED! We are now located at 10677 U.S. Hwy 15/501 in Southern Pines, NC! Don’t wait to request an appointment with our Southern Pines, NC dentists! Fill out the form at the bottom of the page to get started, and our staff will be in touch with you shortly to confirm an appointment time that works for your busy schedule. 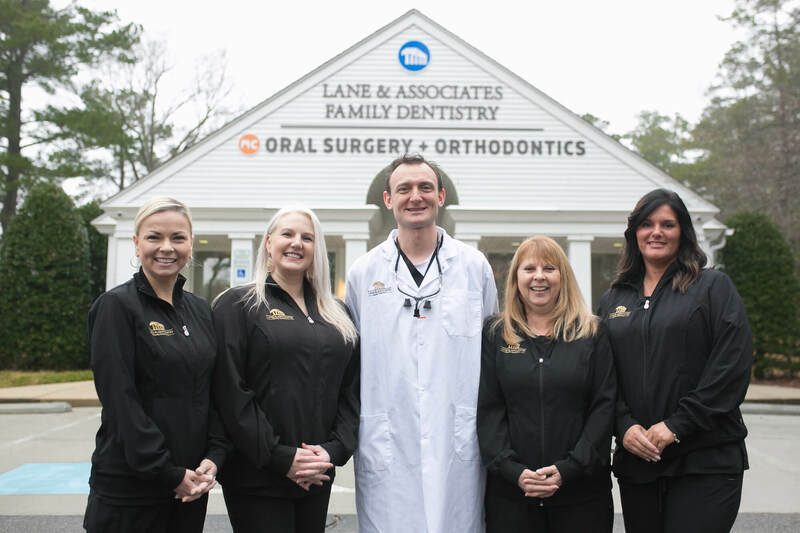 Lane & Associates in Southern Pines partners with an in-house Oral Surgery and Orthodontics group called NC Oral Surgery + Orthodontics (NCOSO).Through this partnership, our companies have started using a fun rewards system for our Orthodontic patients in Southern Pines! It’s called Patient Rewards Hub and every ortho patient can earn gift cards, prizes, tickets, & more when they play or participate in contests in the App! You can even earn points at your ortho visit by showing up in your NCOSO t-shirt! Call our office if you or your child may be interested in starting orthodontic treatment with our Orthodontists in Southern Pines NC today! If you are a current Ortho patient at Southern Pines please click this link to login to your Patient Rewards Hub. If you’re looking for directions to Lane & Associates’ Southern Pines, NC dental office, you’ve come to the right place. Lane & Associates’ Southern Pines dental office is located at 10677 US Hwy 15/501. Still not sure where to find us? Please take a look at our map at the top of our page, email us at lanepinehurst@lanedds.com, or give us a call at 910-295-5980 — we’d be happy to answer any questions you may have. We have a Periodontist in-network with over 18 insurances. We have a Dentist that treats Sleep Apnea and TMJ which we file Medical Insurance to cover most expenses for patients. We offer one (1) day CEREC Crown Technology. We are open Friday when most General Dentists are closed in this area. We offer a child’s first dental visit program. We have access to all specialists through Lane & Associates that are in-network. We offer payment plans through Care Credit. We take same day emergencies. We have a very caring staff. In addition to Southern Pines, Lane & Associates serves dental patients from our locations in Angier, Biscoe, Cary (Green Level West, St. Charles Place and Tryon Rd), Dunn, Durham (Miami Blvd and Broad St), Erwin, Fayetteville, Fuquay-Varina, Garner, Greensboro, Hamlet, Knightdale, Lillington, Mebane, Mt. Olive, Pittsboro, Raleigh (Ridge Rd, Harvest Oaks, Falls of Neuse Rd, Wake Forest Rd), Roseboro, Sanford (Tiffany Dr and Horner Blvd), Southern Pines, and Winston-Salem. "You feel the charm as soon as you step through the door!" I’m new to Lane and Associates, and I just had my first visit! The office is beautiful, the staff are courteous and professional, and also warm and friendly! You feel the charm as soon as you step through the door! I was a little nervous, but my visit was effortless and painless! The Dentist gave me all possible options, and incorporated my needs into a wonderful care plan that made me feel like an empowered patient and a valued member of the team! Lane and Associates is truly a hidden gem tucked sweetly in the quaint town of Southern Pines! Thanks guys for an amazing experience! I look forward to working with you all, and my smile thanks you too! Meet the skilled family dentists at Lane & Associates in Southern Pines, NC! Our dentists and the rest of our staff offer comprehensive dental care from our leading dentist office in the Moore County area. Learn more about each of our doctors below, then fill out the form at the bottom of the page or give us a call at 910-295-5980 to request an appointment. Whether it’s time for your routine dental check-up, or you’d like to talk to one of our doctors about our cosmetic dental procedures in Southern Pines, NC, we’d love to hear from you. Request an appointment today using our on-page contact form, or call us at 910-295-5980.